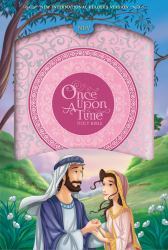 The Bible is not a fairy tale, but every great story happened once upon a time. The NIrV Once Upon a Time Holy Bible contains a presentation page and also highlights six great stories from the Bible on 24 full-color inserts. Each story is told on four pages in full-color, illustrated splendor. Also contains the complete New International Reader's Version (NIrV) of the Bible. Stories include: God Makes Man and Woman Isaac and Rebekah Ruth Finds Happiness Queen Esther Mary and Joseph and an Angel He Lives! We all have our own tale to live and what better place to look for help and encouragement than the greatest story of all.